Hill of Doves: A solo wargame for the First Anglo Boer War enthusiast! 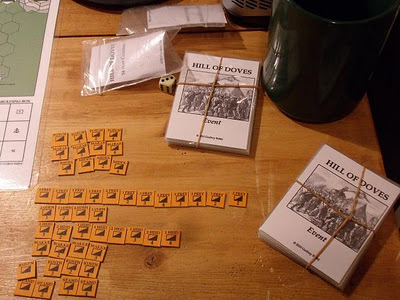 Almost 2 years ago a gentleman by the name of Godfrey Bailey put a challenge out to regular readers of Lone Warrior; a quarterly journal produced by the Solo Wargamers Association, to play-test his solo board game Hill of Doves. Until this request, I hadn't played a decent military strategy board game in years, if not decades! I said yes to Mr. Bailey. He promptly posted the game to me. Upon arrival I opened the package to find a board game with a totally different approach to what I had anticipated. From a quick glance at the rules, what I liked is that Godfrey starts with the big picture during the strategic phase, then he wedges it down to the operational phase by the British army moving through a series of hexes on the operational board and then the big crescendo happens on the tactical board where either the British army succeeds in routing the Boers or they get trounced by Joubert. I accepted the challenge by Mr. Bailey to play 10 complete games and report back to him on what I liked about the game and what needed to be improved if anything. Godfrey’s board game in essence captures the struggle the British faced during the years of 1880 to 1881. The period was when established British troops in the Transvaal were trying to contain and eliminate the Boer during The Transvaal War. As soon as I read the rules I realized this was no ordinary board game and certainly was advanced in design. Mr. Bailey’s board game design is “outside of the box” when it comes to conventional board games. As a solitaire player you play 3 games within 1 game simultaneously. There is also a series of time tracks, weekly, daily and hourly. 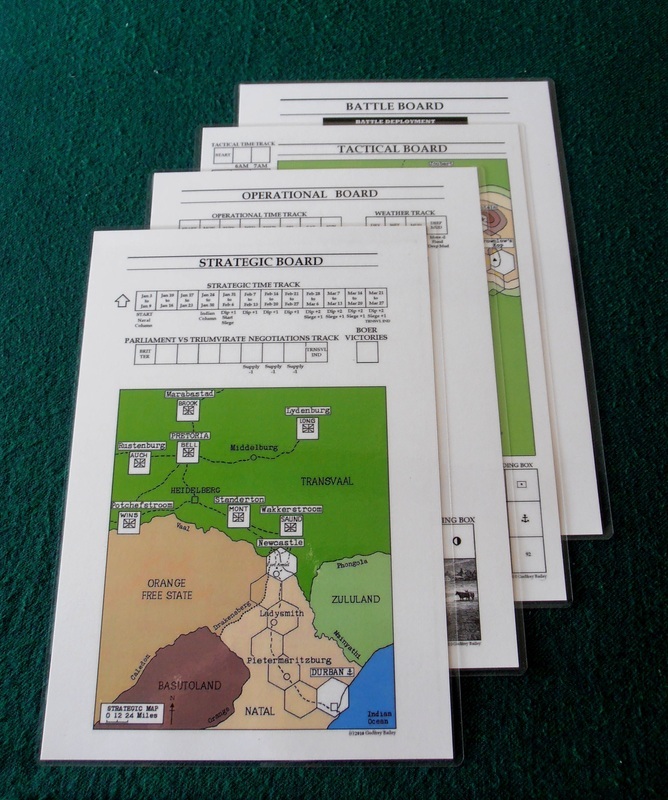 The game boards consist of A4 cards - Strategic Board, Operational Board, Tactical Board and a Battle Board to play out battles. Other components in the box include: 181 Playing Pieces, 38 Event Cards, 1 Game Sequence Card, 1 Quick Reference Card, 1 Assault Card, 1 Ambush Card, 1 Step Marker and 1 six sided dice. The following snap shot is off one of Mr. Baileys You Tube Videos which shows all of the boards in the game including the Operational Board, which is the heart of the game, where you play a week, day-by-day, moving your men and supplies into a position from where you launch assaults against the Boer. The key here is not to get ambushed by the Boer on the way to your targets. What I personally appreciate about this game is it does not require a lot of space to set-up and play. In fact, I played the game daily in my office on my lunch break. The time scale includes a 1 week strategic phase, 1 day operational phase and a 1 hour tactical phase. Game scale is appropriate and it’s a complete solitaire game which can easily be played in 1 evening or in my case a few lunch hours. Godfrey put a lot of thought into the game as you the player command the British Army while the Boer Army is fully automated. To win you as the solo player must control Laing’s Nek and have 12 weeks to achieve this objective. If you as commander fail the Boer win the game. What is absolutely astounding is the game plays religiously close to the real thing. You as the British player must get your troops from Durban through Pietermaritzburg, then Ladysmith and finally to Fort Amiel at Newcastle without being detained by inclement weather, poor roads and other factors. After setting up your base camp at Mount Prospect you must capture key objectives held by the Boer. You must then continue to re-supply your troops in the field with rations, munitions, medical supplies and herds. This game is very realistic and to “top it off,” there is a Politico’s section [Parliament verses Triumvirate] negotiations track. You can lose the game here as well. What really makes this game intriguing is the ambush phase. Just when you think you have a hold on the Boer you may be ambushed and routed. The Operational Board is the key to this game as you are trying to establish a foothold at Mount Prospect and then press forward to capture your 10 objectives in order to win this game. When launching assaults the action switches to the Tactical Board. Your force is represented by counters [Infantry, Cavalry and Artillery) which you move on the board and each counter has a predetermined firepower value. You assemble your counters into tactical columns and move against the Boer for battle. What I love about the game is the Boer forces are generated according to the objective you are trying to capture however you have to guess at what the enemies’ strength might be which builds tension into the game. Another interesting twist comes by the fact that you, the British player, don’t always have the initiative. So, just as you think your strategy and tactics look sound, the Boer launch attacks on objectives that you control by laying ambushes for you to deal with, even possibly attacking your camp and also carrying out raids. In my humble opinion the Boer artificial intelligence system is a very realistic representation of insurgent warfare. I also found that cautious play by the British is punished in the Strategic Phase and cavalier play is punished in the Tactical Phase as you take casualties and lose your initiative, henceforth you eventually lose the game. 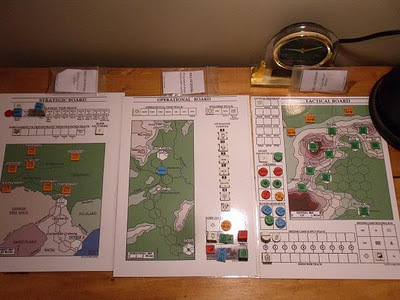 Here we have the Strategic Board far left, the Operational Board in the middle, and the Tactical Board to the right. The Strategic Board has a Time Marker, British Assault Marker, a Naval Column and an Indian Column. Godfrey has also set up a time line to aid in chronological playing of the game. He also has a Parliament vs Triumvirate Negotiation Track for the political aspect of the campaign which in my view is worth noting. In the middle area towards the bottom we have an ox wagon convoy, 25 rations, 12 cartridges, 3 shells, 2 case shot, 1 rockets, 3 medical supplies, and 1 herds. Godfrey has thought of everything to improve accuracy. Here we have the Event Cards, the 36 Boer Veldkornetskap counters, and 12 Boer Patrol counters which will go into a non-transparent container to be drawn randomly. Godfrey has also included a Weather Segment to give an accurate historical account of the weather during the actual war. The Operational Phase includes an Assault Segment, Morning Movement Segment, Event Segment, Ambush Segment, Afternoon Movement Segment, Bombard Laagers Segment, Secure Objectives Segment, Transfer Segment and a Camp Supply Segment. The game plays well and really keeps you on your toes. This game will never get stale and is a keeper in our opinion! If you are a Boer War enthusiast, a military tactician, a board game purist, or a wargamer at heart looking for a good solitaire board game to play then I highly recommend Hill of Doves.